SMSFs can invest in commercial or residential property; however, neither Trustees nor related parties are permitted to live in the property or use the property as a holiday house. The sole purpose of the property must be as an investment of your SMSF. An SMSF cannot normally take out loans per se. However, in order to purchase a property, an SMSF can use a Limited Recourse Borrowing Arrangement. To do this, the Trustees must provide the bank with a guarantee for the loan. You might want to use a mortgage broker to help you find the most suitable loan for your circumstances from a panel of lenders. When we set up a Limited Recourse Borrowing Arrangement for an SMSF, we issue a new Trust Deed. Within the industry, these Trust Deeds are regarded as the best because the banks will generally accepted them for SMSF property loans, thus ensuring that the loan approval process runs smoothly. The cost of any repairs and maintenance undertaken on an investment property can be deducted in the SMSF. To find out more about the differences between repairs and improvements, click here and view the ATO guidelines. when the Custodian Trust uses a Custodian Trustee, use the name of the Custodian Trust, e.g. “ABC Custody Pty Ltd ACN number”. When the loan is paid off, there is no need to keep the Custodian Trust. The property will then revert back to the SMSF. There should be no stamp duty implications as there is no change in beneficial interest in the property. For more info on how you can invest in property in your SMSF, please watch the video below. Lastly, as the Fund purchases an investment property, there are many documents that you need to keep on your records and provide them to us when we prepare the Annual Return for your Fund. To assist you with this, please use the Checklist we provided in the link below when the Fund start to purchase the asset. I am considering creating a SMSF to invest in a residential investment property. We would like to eventually reside in the property ourselves and understand that the SMSF would have to sell the property to a fund member before a member is able to reside in it (with purchase price being at fair market value). My question is whether or not stamp duty would apply on the transfer of the property to a member at the time of sale and/or whether any other fees would apply? Thank you for your assistance. well as a pension or lump sum payment. payable as there is no change in beneficial ownership. are industry consensus and not legal advice – this can be a legal matter. Could you please clarify: is this a mere transfer or nominal sale of the property? Question: It concerns TAX and negative gearing on house investment in a SMSF. If a property is negatively geared does the negative geared tax accumulate year on year or does the TAX department pay the SMSF money back (based on input tax 15%)? In general, negative gearing in an SMSF is not a popular strategy. This is due to the relatively low tax effect in super of 15%. In a personal capacity, the higher marginal tax rates make negative gearing a more popular strategy. Additional to this, banks require an SMSF to have at least a 20% deposit in order to give a bank loan. This makes most properties positively geared from the outset. When the SMSF makes a taxable loss in the current year this loss will be carried over to the next financial year. This loss is then offset against taxable income in future years. A sensible strategy is to use a Quantity Surveyor report like BMT. This will bring forward tax depreciation in property and not only give a time value of money, but also ensure a maximum write-off in the accumulation phase, i.e. before the pension phase where tax is NIL. See our page on property depreciation for more info on this. Can I use SMSF to buy a land and then build two townhouses, sell one and keep one for renting? All expenses for purchasing land and constructions are to be paid by SMSF either from the existing fund or through borrowing under Bare Trust Structure. If I want to buy property I need a bare trust. where do I go on the website to request a bare trust setup or do I just set up 2 corporate trusts? Then add the details for your property and email it over. 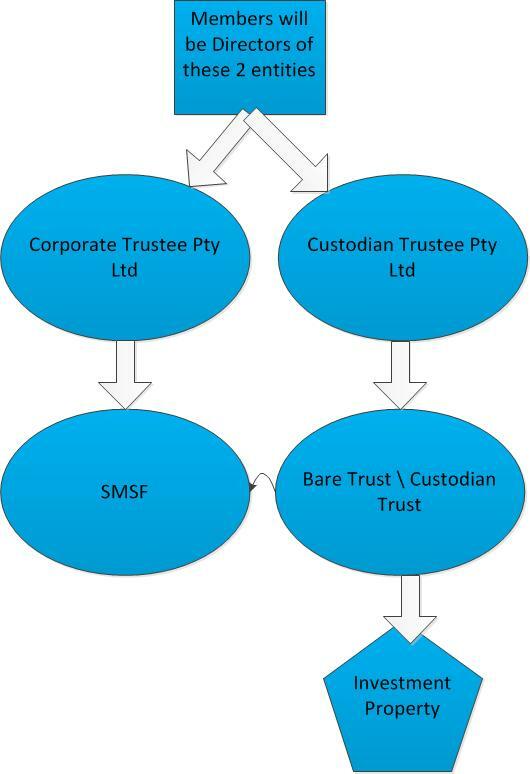 If you do not have an SMSF and want to set up a new Fund with the appropriate structures, we will need to set up 3 entities in addition to the SMSF, as explained in the diagram above. The cost will be 3 x $950 plus $350 to set up the SMSF. This totals $3,200. I have a question I have a super anuation fund held in another country and is producing better returns am I able to set up a smsf and transfer the funds from my Aus super to my overseas super fund? I am aware of cross tasman agreement with NZ however the country in which I hold my other super account is not in NZ. On the basis that the Deed and Investment Strategy of an SMSF allows for it, an SMSF can invest in overseas assets. Trust this gives you some idea of what is allowable. Ongoing cost for Tax returns and Audit is it $79 a month? How do I pay for the investment property in India from the bank account. Is it online transfer from the SMSF bank account or cheque and would I need to pay tax for the amount transferred? How long would it take to set up the corporate trustee fund? If I need to call to ask a query can I ring the number 03 85553238? Fees noted above is correct and we can set up a Macquarie bank account. This is a dedicated SMSF bank account with no monthly bank fees. However, you can set up with another bank if you prefer. Your choice. When investing overseas, the SMSF must have a legal enforceable right to the asset it owns. If the SMSF name is not noted on the property title, we note ownership via a declaration of custody trust. We use external legal documents for this, so there is an extra cost. The phone number you note is our office number. We do not have conversations with non-clients as this may be seen as financial advice. We are not a financial advisor, we are an accounting firm. Hence we can give factual information but the decisions to act is yours. Could you please assist with the below queries. Which Bank would be used to set up? We have a SMSF. We bought a property outright 4 years ago. We now want to borrow money from our SMSF and invest in an independent business overseas(not run by us), for 15% of the profit. Is this possible? An SMSF can generally not have any borrowing unless certain conditions are met. Thank you for all the great info. Can we set up a SMSF and buy our current PPOR with a loan (<70% LVR), to rent out as an investment property?, So that we can then buy a new PPOR that is more expensive. Do we have to pay stamp duty in this case? I note in a comment below, if you want to transfer it back to your ownership for e.g. at retirement, no stamp duty is payable. What is the cost to have a consultation to discuss positives/negatives of what we are thinking? I do have lots of questions about the possibility of buying properties within SMSF. An SMSF can’t purchase a residential property from a related party (you).